Life before weight-loss surgery often feels like a constant struggle. After weight-loss surgery, diet plans, work out sessions, and multivitamins become the way of life. There are three important ingredients in the recipe for weight-loss success after surgery; blood tests, body composition vs. body weight, and exercise. It’s not as scary as it sounds. Due to the potential risk for, and serious health consequences of, vitamin and mineral deficiencies and the additional risk of B12, iron, folic acid, and calcium deficits, it is essential that the bariatric patient have an annual blood test for vitamin and minerals. The test should include measurement of red blood cell and serum folic acid, vitamin B12, and ferritin. Blood calcium levels are not reflective of calcium loss. Therefore, it is important on a regular basis to have tests performed that are indicative of calcium deficits, such as parathyroid hormone, or tests that check for metabolic bone disease, i.e. bone scan, bone density or mineralization test, or markers of bone turnover. NOTE: Blood tests will be drawn to detect possible thiamin deficiencies if symptoms appear, the patient does not take the correct vitamin and mineral regimen, or vomits frequently. Appearances can be deceiving. 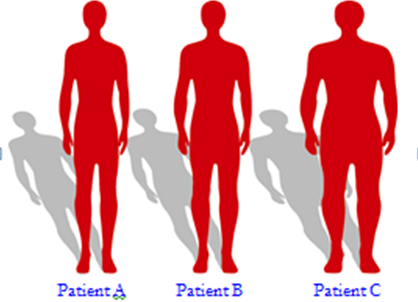 Look at male patients A, B, and C. They are exactly the same height. A and B have the same weight, and C weighs considerably more. For his height, C appears to be fat. But after analyzing body composition, B and C have acceptable levels of fat while A is over the healthy limit. Even though A appears to be healthy, he is at a higher risk of developing weight related health problems because of his higher fat mass. Fat mass (FM) is total amount of fat in the body measured in pounds. Fat Free Mass (FFM) is the weight of non-fat tissue in pounds. FFM includes muscle, bone, intestines, skin and all other fat free tissue. The fat percent for men should be no higher than 20%, and women should have no more than 30% fat. These are percent fat values for Bariatric patients only. Acceptable fat percent values are lower in the standard adult population. So remember, being healthy is more than being skinny. Studies have found that individuals who are morbidly obese have an increased capacity to store fat and a reduced capacity to burn fat. Even after weight-loss, your body’s ability to burn fat is not improved, increasing your risk for weight regain. Moderate exercise performed daily cause’s changes in the ability of your muscles to burn fat. Moderate exercises, when performed regularly and for a period of 30 minutes to an hour daily are apparently the best for increasing the burning of fat. These exercises burn the most fat and are most effective in helping to lose or maintain weight loss if performed before breakfast or at least 6 hours after a meal. Besides increasing the body’s ability to burn fat, exercise reduces emotional stress and the risk for stress-associated eating abnormalities. Exercise increases levels of certain brain messengers, such as serotonin, that reduce food cravings and provide for an overall feeling of well-being. Furthermore, exercise increases muscle mass with a resultant increase in metabolism helping to promote and maintain weight-loss long-term. Cardiovascular: Cardiovascular activities help to reduce the risk of heart disease, improve metabolism, regulate hormone levels such as insulin, and increase muscle endurance and strength with subsequent enhancement of metabolic rate. Furthermore, cardiovascular exercises stimulate fat breakdown from fat storage depots and increase the body’s utilization of fat for fuel. Muscular Strength: Strength exercises help to prevent muscle and bone loss following surgery and help to build muscle and maintain or even increase resting metabolic rates (calories burned) during the rapid weight loss period. Flexibility: Flexibility exercises include those that help to stretch muscles and increase the range of motion of joints. By keeping these three ingredients in mind during life after surgery, you are set up for long-term health and weight-loss success. To learn more about the FirstHealth Bariatric Program you can attend a bi-weekly free weight-loss surgery information session or visit ncweightlosssurgery.org. FirstHealth Moore Regional Hospital offers treatment and support to patients in the Pinehurst, Raeford, Sanford, Lumberton, Laurinburg, Rockingham, and Troy regions of North Carolina and beyond.